Incurred Claims Ratio (ICR) for Health Insurance Companies in India is published by IRDA (Insurance Regulatory & Development Authority) every year. 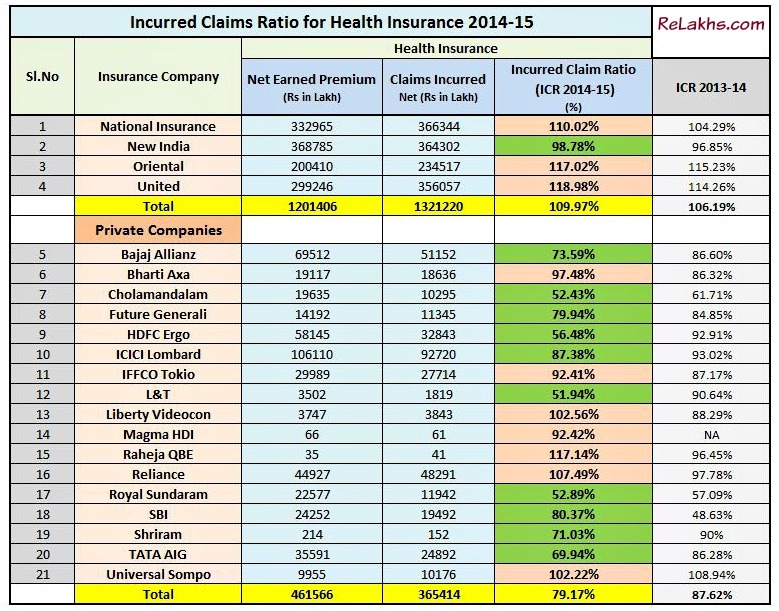 On 19th Jan 2016, IRDA published the incurred claims ratio for Health Insurance 2014-2015. Based on the IRDA’s annual report (2014-15), I have listed down the top 10 best Health Insurance Companies in India. These health insurance companies have been shortlisted as per ‘Incurred Claims Ratio‘. What is Incurred Claims Ratio (ICR)? Incurred Claims Ratio is nothing but the total value of all claims paid by the health insurance company divided by the total amount of premium they collected in the same period. Incurred Claims Ratio indicates the company’s ability to pay the claims. As an example a 80 percent incurred claims ratio means that for every Rs 1000 of premium earned in a given accounting period, Rs 800 is paid back in the form of benefits (claims). Incurred Claim ratio is the ratio of the claims settled to the premium received. So, how to analyze the ICR data? Whether a Health Insurance company which has say ICR of 110% is better than a company which has incurred claims ratio of say 85%?? Let us now understand this point. If ICR is greater than 100%, it means that the company has given more money away as claims than what it has collected as premium. This is not good for the company. If ICR is less than 100% say in the range of 60% to 90%, it means that the health insurance company has given lesser amount as claims than what it has collected. It means that they are making profits. If ICR is very low say 30%, it means that either the company is charging higher premium rates than its peers and making huge profits (or) it has a good pool of low-risk (may be youngsters) profile individuals as clients (or even both). Hence it is better to be with an insurance company which has neither high nor low incurred claim ratio. I believe that the ideal ratio (percentage) range can be anywhere between 60% to 90%. The main difference between Incurred Claims Ratio and Claim Settlement ratio is – Incurred Claim ratio is the ratio of the claims settled to the premium received. Claim Settlement Ratio (CSR) is the ratio of claims approved to total claims made (received). The higher the CSR the better. Same is not the case with ICR. Non-Life Insurance companies provide products under various segments like Motor, Health, Home, Personal Accident, Travel, Marine and other types of Insurances. In this post, we are analyzing the ICR details of Health Insurance only. Below are the details of Non-life insurers’ incurred claims ratio for Health Insurance vertical. The net incurred claims of the non-life insurers stood at Rs 55,232 crore in 2014-15 as against Rs 49,179 crore in 2013-14. The incurred claims ratio (net incurred claims to net earned premium) of the non-life insurance industry was 81.70 per cent during 2014-15 which is marginally less than the previous year figure of 81.98 per cent. You can notice that Public sector non-life insurance companies like National Insurance, Oriental & United have Incurred Claim Ratios of more than 100%. So, does this mean that the PSU Non-life insurance companies are making losses? Kindly note that these companies also provide other types of insurance covers like Fire, Marine, Travel, Motor etc., Their health insurance vertical may not be making profits but other verticals might be generating profits. As far as Private General Insurance companies are concerned, the ones which have reasonable and are close to total average ICR (avg ICR of all Pvt companies is 79.17%) have been highlighted in GREEN. You may prefer buying health insurance policy from these companies. All the stand-alone ones or the specialized health insurance companies like Apollo Munich, Max Bupa, Cigna TTK, Religare & Star Health have very good Incurred Claims Ratio which is around 60%. So, it is clear that these are the best health insurance companies and can be preferred to other ones when buying a mediclaim or family floater health insurance plans. I have analyzed and short-listed the best non-life & stand-alone health insurance companies based on the latest Incurred Claims ratio data. How to buy best Health Insurance plan/policy? When it comes to health insurance, there is no one-size fits-all plan that you can rely on. Medical Insurance is a contract based policy with legal jargon thrown in. Besides this, a Health Insurance policy has medical terminologies. Of the numerous medical insurance plans in the market, you may find that each one is unique in some way or the other, with its own benefits and limitations. The Incurred Claim Ratio (or) Claim Settlement Ratio can help you in shortlisting the best health insurance companies but you have to do a lot of research to identify the right and best health insurance plan which suits your requirements. You have to make a comparison of health insurance plans offered by multiple companies. This is where I believe that health insurance comparison websites could be very beneficial. I hope you find this article useful. Do share your views and comments. Hi Sreekanth, I am 30 and my wife is 28. We do not have any medical history. My mother(56) does not have any medical history either, but my father(57) is getting medicines for diabetics. Both my parents are working and will get retired in 2019. My annual income is 13 lakhs. 1.I want to know if a family floater is advisable or a standalone for my parents and one for me and my spouse? 2. As my parents are working now, can I claim tax rebate on the premium I pay for them? You may take a Family floater plan for self & spouse and later on can enhance the sum assured by opting a Super top up plan. What are super top up plans? You may consider buying a stand-alone (separate) policies for your mother & father. Health insurance plan for Diabetic individuals. Evaluate these factors when buying a medical insurance plan. Yes, you can claim the tax rebate u/s 80D on the premiums paid by you for your parents.. Myself Anirban from Kolkata, I have a floater policy of 8 lacs rupees which includes me, spouce, son (3yr) and mother (55yr) from Oriental Insurance. But this the premium has been increased almost 10 thosands and next year due to age band it will further increase by same amount, hence I would like to port my policy to star health insurance. I like to have your advise regarding the pros and cons of my decision ? Always advisable to have stand-alone (individual) mediclaim policies for Parents. Because the premium of a floater plan depends on the eldest member of the group. Suggest you to check with them if it is possible to get one separate mediclaim policy for your mother and continue your family floater (self+spouse+kid). first of all thanks you to give us deeply details about health insurance. I want medical policy up to 5 lakhs for 2 adults below 30 yrs and one child below 3 yrs. can you pls. suggest that shall i go with Govt. insurance or public insurance and also pls. suggest who one or two suitable according to my requirement. Evaluate these factors when buying a health insurance plan. Is claim settlement ratio the only measure available to consumers to help them make a decision ? I feel more data is required by customers. Especially what percentage of “number of claims” received by the company has been settled ? Example: Company A got 10 customers who pay a premium of 10,000 INR each and this policy lets say allows them to claim upto 5 lakh INR each per year. Lets assume that 5 of these customers made claim worth 1 lakh each during the year. Lets also assume that company A approved only 1 claim and denied 4 claims for flimsy reasons. Now here is the math: In this example, company A earned total premium of 1 lakh INR for the year (10,000 * 10 customers) and paid out 1 lakh to customers. So Incurred Claim Ratio = 100 percent BUT actual claims settled = only 1 out of 5 = 20 percent . If customer looks at Incurred ratio it looks great …wow 100 percent..BUT the real deal is how much number of claims they settled..ie only 20 percent (1 of 5 claims) in this example. The measure “incurred claim ratio” we are discussing in your article suits the company not the individual. Your opinion please ? Both ratios give different perspectives and I believe that both are important factors when buying an insurance policy. Hence I have mentioned about the importance of ‘claim settlement’ also in the last paragraph of the article. in the current scenario of raising medical expenses, what should be the ideal amount of health insurance a family should have ( family of 4 with 2 adults and 2 children)? according to health data, health expenses are raising every year by around 12% annually. kindly advice whether to go for individual cover or family floater cover? May I know the ages of your family members? Thank you for your reply. I meant the doubt for a general family of simple lifestyle with eldest member being the sole bread winner around 40 yrs and wife and 2 small children. Medical history is normal. residence location is a simple tyre 3 city ex shivamogga of karnataka. many people ask me this doubt, how much health insurance they should have? i was also unaware. ( donno if there is any rule like for life insurance it is 10 times annual income). One can consider 50 to 100% of annual income + average medical expenses in the last 5 years or so, for arriving at approx health cover. One can also enhance Sum assured by opting a Super top up plan to the basic/existing health insurance plan. Kindly read: How Super Top up plans work? First of all thanks for sharing this with us. I am planning to buy a health policy for 2 adults. Evaluating the option of Public sector companies? Is there any potential risk associated here? If such plan(s) meet your requirements and are affordable to you, no specific risks (pvt Vs public sector). Do you have any analysis of Group Medical Insurance claims etc for last 2-3 years? Dear Ramakrishna …As of now, have not done the analysis..You may try checking out for the same in IRDA’s annual reports. Pls suggest some health insurance company. Dear pawan .. May I know why do you want to Port the policy? Would like to understand the reasons / your viewpoint. Please do not go for Religare Health Insurance, their features and pricing are attractive. However when the time comes to make a claim they are will find all possible ways to deny your claim and they are not at all helpful. I WANT TO PURCHASE HEALTH INSURANCE FOR MYSELF NOW I AM 52 I HAVE A PRE EXISTING DISEASE LIKE PVD FOR WHICH I HAD TO LOOSE MY LEG BELOW THE KNEE AMPUTATION AT APPLLO HOSPITAL, NOW I AM TAKING MEDICINES FOR THE PVD/PAD. THE MEDICINES ARE MOSTLY BLOOD THINNER LIKE ACITROM AND ECOSPRIN 75 MG THE AMPUTATION HAD HELD IN JUNE 2015. PLEASE SUGGEST/ADVISE THE SUITABLE HEALTH INSURANCE FOR MYSELF AND IF POSSIBLE FOR MY FAMILY MEMBERS, 2 ADULT AND 2 CHILDREN MYSELF 52 ,SPOUSE 50, FEMALE CHILD 22 AND MALE CHILD 19 AGE. FROM ODISHA PIN 760001. Its advisable to have separate Mediclaim policies for 4 of you. Kindly search and compare health insurnace plans in these PORTALS and do inform the prospective insurance company about your medical status/treatment. Kindly read: Evaluate these factors when buying a Health Insurance Plan. My Father is 56,Mother 50. Should i ask my father to buy the policy in his name with my mother as other party and I buy a separate Health Insurance for me ??? In both cases, what would be the best Health Insurance provider to go to. For 10 Lac cover. Suggest you to take stand-alone mediclaim policy. In case if your parents do not have any health issues, they can consider taking a Family floater plan. 3) Is 10L ac rs policy fair to go for? 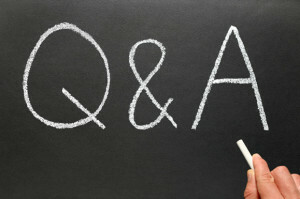 4) Is it OK to buy online or bette rto go thro’ some agent? 5) Any specific item to take care of? eg. Shall I enroll for 2-3 years plan upfront or enroll for 1 year only? 1) As of now, you may take family floater plan (2+2) with a Super top up plan (in the near future). What are Super top up health plans? Evaluate these important factors when buying health plans. 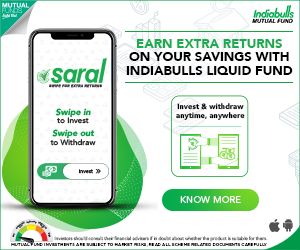 3 – May be yes, with a Super top up plan. 4 – Choice is yours. If you are comfortable buying online, suggest you to buy directly. Is Family floater policies available if Self is NRI and other members (Wife & kids are local residents)? If not, can the policy be taken in wife’s name (who is resident Indian) and self (NRI) and kids (local residents)? If not, How NRI could be covered? Yes, NRIs can take health insurance plans (floater also) from Indian Insurance companies. But, I believe that he has to travel to India for treatment and only then he/she can claim the treatment expenses. Spouse/kids can also claim in India. Best portals to compare health plans in India. I am Venkatesan, Health insurance agent, Your data about the health insurance companies are very useful, to choose the health insurance based on ICR, it varies between Public Sector Companies and Private players, even through the ICR is more with PSU’s they can withstand any sort of claim ratio even in any unexpected major events taken place in a particular period also due to competition and many more health insurance players are in the market, PSU companies services also improved to the maximum level even competing in technology implementation. my sincere suggestion to the customers as Mr.Sreekanth suggested compare the plans of different companies also have discussion with the professionals before taking final decision. Thank you dear VENKATESAN for sharing your views. Keep visiting! 1. Should I choose standalone insurer like Apollo, Max Bupa etc. or Public insurer? Which one is better in terms of claim settlement? 2. Does premium increase after every year? or some age group like when I cross 35 years age? 3. Does premium increase if I claim in any one year? Kindly understand the difference between Claim settlement & Incurred claim ratio. 1 – Personally, I prefer stand-alone ones based on Incurred claim ratio & Quality of customer service. 2 – Yes, can increase. 3 – That depends on ‘loading on premium’ clause. Most of the latest plans do not have ‘premium loading’ on claim. Evaluate these important factors when buying a Health plan. I have not understood one comment of yours. You start by saying that the Companies with best Incurred Claim Ratio(ICR) . From the table it is observed that the companies with best ICR are the Govt. Companies like National Insurance,United, Oriental, etc. However, later on you do not advise any of these companies. Instead you recommend Apollo Munich, Star Health, Max-Bupa, Cigna, etc. Why is that ? Is there any other factor that you have considered while making this recommendation ?? Is it because these companies have better Claim Settlement Ratio (CSR) ? But you have said that the comparison is based on only ICR. Can you please clarify my doubt. Kindly understand the meaning of ‘Incurred claim ratio’. (kindly go through the article again). 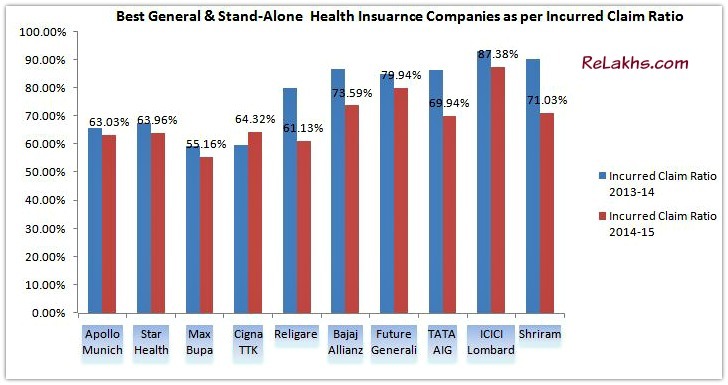 All most all PSU general insurance companies have more than 100% ICR, which is not a good indicator. Thanks for the reply. I did understand the concept of ICR . Yes , I saw that all PSU GI companies have more than 100% ICR, which means that the money paid to settle claims is more than the revenue earned through premiums. But you yourself has explained this. To quote you…” Kindly note that these companies also provide other types of insurance covers like Fire, Marine, Travel, Motor etc., Their health insurance vertical may not be making profits but other verticals might be generating profits….”. As I understand the article says that despite making a loss in Health Insurance, they are making up in other form of insurance. This means that they are not going to close down due to losses…right. If that be the case, isn’t it better to opt for a PSU company where ICR is high. for health insurance. Moreover, a couple of my acquaintances who have taken out policies with Companies like Star Health, Apollo Munich, etc., told me that one danger of these companies is that, they go on upwardly raising their premiums every year depending upon their profit or loss. The premium table that they adopt this year may not necessarily be the same next year. They make representations to the IRDA which then allows them a hike. Once again thanks for the reply., though it has not answered my confusion. But appreciate you taking time off to do so. I am neither for or against any non-life insurance company. Based on my personal experience and the comments shared by blog readers, I do provide a list of suggestions when someone asks for shortlisting the plans. Quality of Service provided is also an important factor that needs to be considered while shortlisting a plan. Thank you for sharing your views. Keep visiting! Yes its possible that like any other PSU, Govt. Owned Insurance Companies would have poor service. Of course, your article was very informative. I absolutely agree that it was objective and without any bias. I am planning to take health insurance policy for my parents (age father 59 ,mother 56) with no major problems till now with SA of 5 lakhs. 2) Apollo Munich Optima Restore – premium starts with 28k for first 2 years and then jumps to 38k from 3rd year but here the SA insured also becomes 10 lakh from 3rd year onwards. Can you tell which of these should I take. Also will it be more beneficial to get a higher SA assured with a top up with Max Bupa rather than pay extra premium for 10 Lakh for Apollo Munich. I believe that increase of premium is indicative only, it can increase more than what has been provided. Very tough to say which the best, especially if it is a health plan. Yes, you can opt for a Super Top up plan along with a base policy, but do watch out for sub-limits & co-pay clauses w.r.t base policy. Evaluate these 11 key factors when buying a Health plan. Best portals to compare health plan. Best Super Top up health insurance plans. Pse. Help me to choose better health insurance for me. For a coverage of 3 lakh. Pse help me to choose best one. 11 vital factors to evaluate before buying a health plan. I am 41 years aged and joined the below Term & Health Plans recently….. I would like to know about the Premium in future years as i am getting older each year – will the premium also got increased in each year or not?? Is the premium is directly proportional to the age in each year or it will be based on the joining time of Age??? I heard that the Pure Term Plan premium will be same for lifelong? What about the Health Insurance Plans premiums?? Term insurance premium will remain the same. Health insurance premiums can increase. Regarding critical illness , kindly check the policy wordings. It is very tough to advise on the best and suitable health insurance plan for an individual, as there are lot of things that one needs to look into before shortlisting one. Suggest you to read: Best portals to compare health insurance plans. It has clarified doubts about selecting a better health insurance company. However, I have noticed many people are still reluctant to buy health policy from private or stand-alone companies since they have faith in 4 established government companies. This is because ICR is more than 100% for almost all. They may be assured about their claim settlement. Also, I have gone through your blog on “Best portals to compare health insurance plans”. I found Coverfox to be very useful as it doesn’t require one to share personal information and subsequent irritating marketing follow-up calls. (As in the case of Policybazaar, PolicyX etc.). However, one needs to closely pay heed to features of the policy since it only lists all available products for a particular amount of health cover and doesn’t recommend a particular product and final decision still needs to be taken by the customer. Dear Rupali..Kindly read the difference between ICR & Claim settlement again and then you may revert to me with your views. Yes, I took like the features that are available on coverfox portal. There is no one-size fits all kind of health insurance plan, the customer has to take final decision by himself based on the available shortlisted ones. Rupali for for Apollo Optima Restore. I want buy family floater health insurance plan. Kindly please suggest, also please note my mom & dad both comes under senior citizen club and have medical history especially of my mother. Are you planning to include your name too in the family floater? Suggest you to buy a separate mediclaim policies for your mother and father (considering you mother’s medical condition). Kindly read: Best Portals to compare health insurance plans.